Sacroiliac joint injections are used to treat patients that are experiencing chronic lower back pain that is originating from the sacroiliac joint. Some have suggested that between 15% and 30% of patients experiencing chronic, nonspecific pain are also afflicted with pain in the lower back owing to the sacroiliac joint. Of the existing interventional treatments available, both extra-articular and peri-articular steroid injections within the sacroiliac joint have provided patients with pain reducing benefits above and beyond placebo in randomized control trials. Further, these findings were sustained when the patients were evaluated at a one month follow-up. The sacroiliac joint is large and located at the base of the spine, connecting the spine with the hip. Thus, it is responsible for bearing the weight of the patient’s upper body and limbs. As such, this joint only permits a restricted range of motion in order to allow for maximum stability. 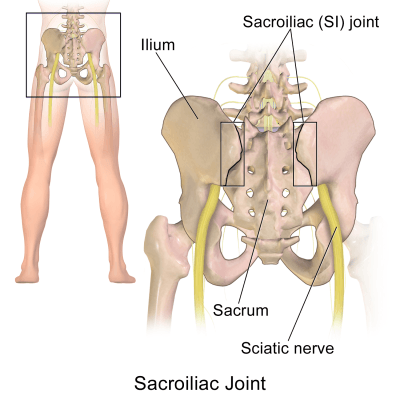 The sacroiliac joint is a diarthrodial joint and joins the ileum (pelvic bone) and sacrum (base of the spine). The surfaces where the ileum and the sacrum come together are covered with a thin plate of cartilage. The space between them is filled with clear, viscous synovial fluid and is enclosed within a fibrous capsule. The sacroiliac joint injection is given in the area just outside the membrane of this fibrous capsule. Using only a local anesthetic and a fluoroscopic device (or x-ray) as a guide, a physician inserts a very small needle into the desired area between the vertebrae. 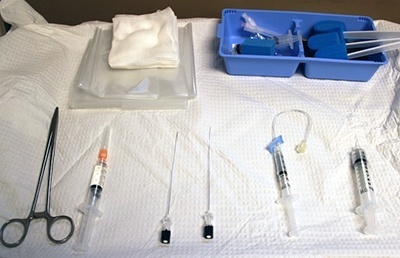 Contrast dye is used to test for proper placement of the needle prior to injecting the steroids, as well as appropriate distribution of the solution within the area of interest. Once proper placement has been assured, the physician administers the steroids. Moreover, steroids are administered only in the areas with the most inflammation. This reduces the amount of exposure the patient has to the steroids. Sacroiliac joint injections are non-surgical and easy to administer. They can be administered on an outpatient basis, using only local anesthetics. Some patients are given an anxiolytic so that they can feel more comfortable. Most patients treated with sacroiliac joint steroid injections are expected to feel an immediate reduction in pain severity. Following the procedure, patients are monitored for pain relief, as well as any adverse side effects. Sacroiliac joint injections are commonly utilized among anesthesiologists for the treatment of chronic, nonspecific lower back pain that is a result of inflammation, irritation, or injury within the nerves of the sacroiliac joint. Sacroiliac joint pain can be difficult to diagnose as it may be attributed to a new injury or strain in the lower back. Indeed, previous work has reported that as much as 40% to 50% of individuals with confirmed sacroiliac joint pain are able to identify a precipitating event that likely played a role in the onset of the pain episode. These events have included motor vehicle accidents, falls, and repetitive stress. Acute events, however, do not account for all cases of sacroiliac joint pain. Previous research has identified a number of characteristics that seem to be associated with an increased risk for developing sacroiliac joint pain. These factors include discrepancy in length between the legs, transitional anatomy, gait and biomedical abnormalities, persistent strain, scoliosis, or even pregnancy. Pain in the sacroiliac joint is typically experienced as a nonspecific pain throughout the lower back. Of primary importance to the physician when determining a patient’s treatment plan for addressing sacroiliac joint pain is the patient’s current degree of impairment in terms of strength, flexibility, and balance, as this can determine the patient’s ability to undergo physical therapy without significant pain. The physician may also wish to have the patient undergo a trial of more conservative interventions prior to initiating interventional treatments. Sacroiliac joint injections are an efficient interventional treatment option for patients experiencing debilitating lower back pain related to irritation of the nerves within the sacroiliac joint that has likely begun to affect ambulation or other motor movements. This treatment is non-surgical and can be administered on an outpatient basis. Further, many patients are able to feel some relief from their pain almost immediately. Individuals are encouraged to speak with their doctor about whether or not this procedure is right for them.